An estate plan is something that everyone needs, but that most people put off for a variety of reasons. You may think that you only need an estate plan if you have many assets or if you are nearing retirement age. However, having a comprehensive estate plan in place can benefit everyone and can help you protect your family in the future. Depending on your needs, you may benefit from establishing a will, trust or other asset protection plan. The best way to find a strategy that suits your circumstances is to work with qualified attorneys at a Colorado estate planning law firm. 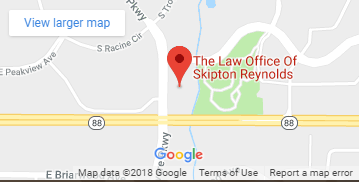 The Law Office of Skipton Reynolds, LLC, located in Centennial, Colorado is a trusted estate planning law firm. We provide comprehensive legal services tailored to meet both your present needs and your future goals. We are experienced in every aspect of estate planning, including wills and trusts, asset protection, and elder law. However, we are also dedicated to working with you and keeping you informed every step of the way. This helps you make sure that every decision about your assets and their distribution comes from you. Estate planning is the process of designing a final plan for managing your belongings if you become incapacitated and distributing it after you pass away. These are assets owned by you or jointly with others. This process accomplishes your personal and family goals while easing the management of your financial and legal affairs. An estate plan can also minimize taxes, if your estate is large enough for taxes to be of concern. When we talk about an estate, we mean all possessions of any value that you own, including physical property, business interests, investments, insurance proceeds, personal property and even your personal effects. An “estate plan” refers to the way in which your estate is passed on to your loved ones upon your death. Estate planning can be accomplished through a variety of methods. Our Colorado estate planning law firm can help you understand these methods and enact the best strategy for you. Whether you want your trust reviewed by an estate lawyer or would like to create a new trust to protect your estate, rest assured that you can count on The Law Office of Skipton Reynolds, LLC. Each situation is different, and it is important to make sure that your documents are written professionally and thoroughly, covering every contingency. Some estate documents are practical but are impeded by the fact that they do not cover all situations. We want to make sure that you are prepared no matter what your life brings you. At our Colorado estate planning law firm, we understand that communication is essential to a positive outcome. Beginning with our Free Educational Workshops, we want to be there for you in whatever way that we can. We are here for you and your loved ones. Please contact us at (720) 613-2633 to start your process of getting your plan in place today.